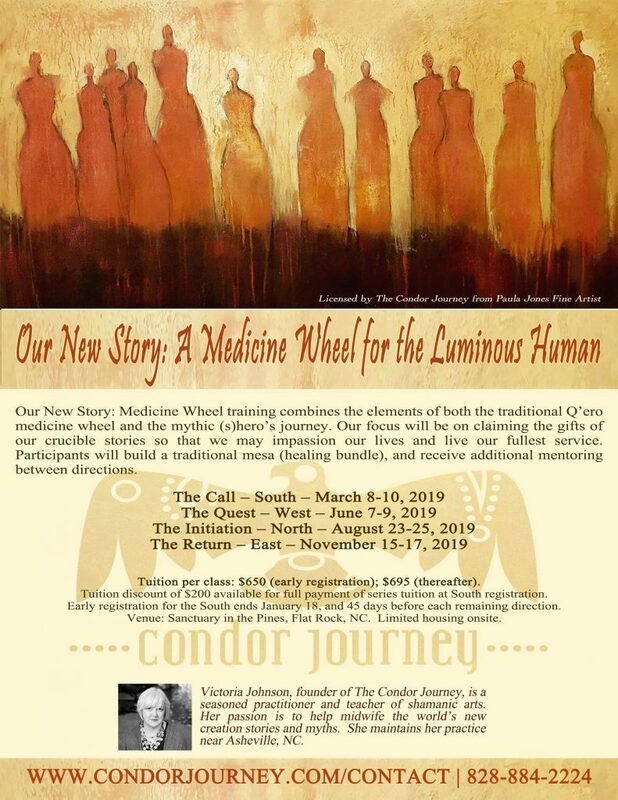 This elegant four-part year-long training, will combine the elements of the traditional Q’ero medicine wheel training (mesa creation) and the stages of the (s)hero’s journey, as described by Joseph Campbell and Dr. Jean Houston. Both the medicine wheel and the (s)hero’s journey are ancient archetypal maps of consciousness that support a deep healing journey. During this powerful experiential training, you will build a mesa (medicine bundle or altar) for your personal healing work. You will participate in powerful processes and ceremonies that help you to shed your past, your limiting beliefs, and assist you in making peace with your ancestral and karmic lineages. You will receive rites of initiation that link you to ancient lineages. The training will also help you to discover and claim your soul’s purpose, deepen your abilities to track (training and strengthening applied intuition), and assist you in visioning the world you wish to create. Tuition per class: $650 (early registration); $695, if after. Early registration ends January 18 for the South (and 45 days before remaining directions). Tuition discount of $200 available for full payment of $2,400 (by January 18). Venue: Sanctuary in the Pines, Flat Rock, NC. Limited housing onsite. The world is in such a place of transition now as we experience the falling away of what must die, so that the new story may be born. A great love story…. It is crucial that we all greet this process with wisdom and clarity, so that we may make empowered choices about the future of humanity. Indeed, to help create and empower the new story of humanity. Our new story must be epic! But it must begin with our own work. Are you ready for that? Are you ready to join a heart centered community of co-creators in this ancient process of the (s)hero’s journey? If so, please join us for “Our New Story: A Medicine Wheel for the Luminous Human,” beginning on November 2, 2018. This training is a prerequisite for a professional energy medicine certification training to begin in the fall of 2019. If you are interested, have questions, or would like to register, contact Victoria Johnson (contact Victoria) or call 828-884-2224. We look forward to supporting your epic journey!